A lake, river or stream is made up of more than the water within the banks. These systems also include all the animals and plants in and adjacent to the waterbodies and the network of waterways within the watershed. As Alaska’s population and associated urbanization increase, lake and stream systems throughout Alaska are vulnerable to degradation of fish habitat and riparian vegetation. 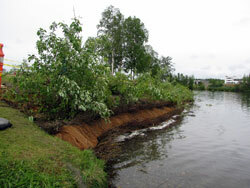 The Department works to protect and restore fish habitat by identifying barriers to fish and restoring fish passage, removing structures such as riprap, jetties and bulkheads that are harmful to fish, revegetating riparian areas, and providing educational opportunities for people to learn about fish habitat and riparian health and function. 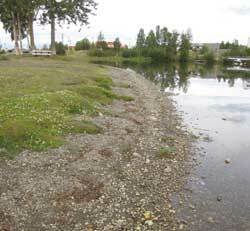 Before and after riparian revegetation using brush layers and native vegetated mat at Newcomb Park on Wasilla Lake.